In keeping with the environmentally friendly motto for adidas’ new SLVR brand—”reduce complexity”—the global sport retailer has used a light touch for its ﬁrst SLVR retail store, located in an existing Soho space. 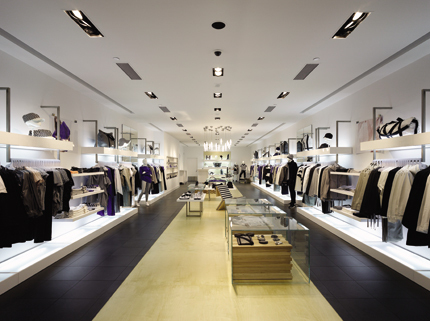 Designed by Sid Lee with adidas’ retail concept team, the 2,700-square-foot interior uses four main materials with a clean, modern aesthetic: recyclable wood, plywood, glass, and metal frames. The space serves as a blank canvas for adidas’ collection of men’s and women’s apparel, footwear, and accessories, while incorporating organic elements such as locally sourced wood in the form of paneled ﬂooring, along with custom wooden chairs that are draped with felt to highlight seasonal colors and patterns from the collection. 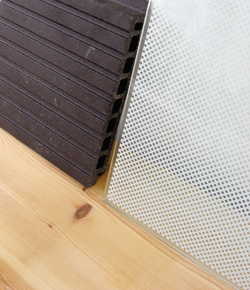 These textures are accented by polished glass and steel found in the display cases and overhead tubular lighting. In keeping with the line’s eco-conscious production process (the “Zero Waste” t-shirt is cut from a single piece of fabric), the designers demolished no walls to create the new store, instead reusing the existing structure. As the ﬁrst stand-alone SLVR location to date—outposts are to follow in Paris, Miami, Bangkok, and Los Angeles—the space admirably embodies SLVR’s quest for a smaller carbon footprint. 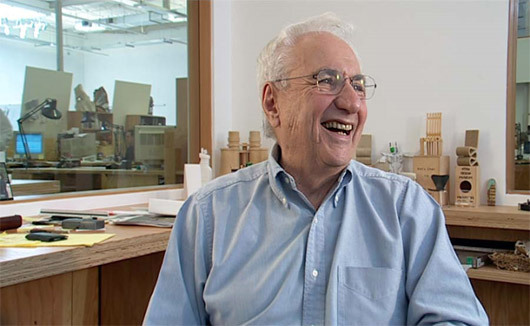 A few days before his 80th birthday on February 28, Frank Gehry sat down with his good friend, the author and historian John Pastier. The two ranged widely over the architect’s life and work, touching on how he’s been hit by the economy, energized by Obama, and inspired as ever by new technology. They speak candidly about Gehry's frustration with his postmodern peers and the fate of favored projects, among them Brooklyn's controversial Atlantic Yards. John Pastier: Looking back, did you ever hope or imagine that you would get this far professionally? Frank Gehry: No, and even though I’m conscious of where I am professionally, I’m actually unconscious of it because psychically I don’t feel any different from where I’ve always been—I’m always nervous, insecure, etc. I think it’s a positive thing, it helps keep you grounded. I’m just more comfortable there, so I do that. But it’s pretty exciting, much of it. 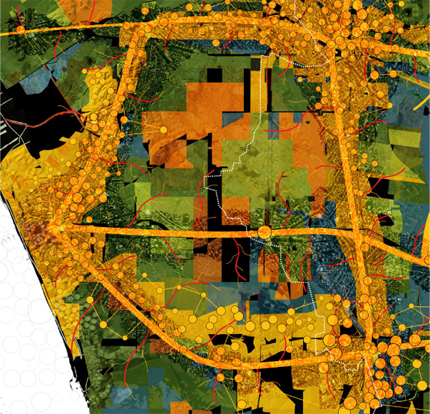 Originally I wanted to do city planning and big-scale urban design projects and social housing. But there was no interest in having architects involved in that. The social housing projects all stopped—HHFA, NFA, etc., didn’t continue. You started your career working for Victor Gruen. What prompted your leaving in 1960? They were promoting project managers while the design types were being marginalized. I wasn’t the same Frank Gehry back then. I couldn’t get up and do public presentations. I was very shy and had a hard time with all that. The guys that could do it were promoted and made associates of the firm. I was productive, but they weren’t promoting me. In hindsight I think they felt that I was angry. I went through a period where I was always angry and they didn’t know what to do with that. They wanted me to be happy and I couldn’t be, I couldn’t fit in. I wasn’t comfortable even though I often got to work with Victor very closely, and with Rudy Baumfeld, and Edgardo Contini, people who I adored and respected. The office had people like Fred Usher, Marion Sampler, Gere Kavanagh, Kip Stewart, Greg Walsh, and John Gilchrest. It was a place that was interested in art and culture and design. Some of them came out of the Eames office. There was a lot of energy and it felt good. It was a very vibrant group and Rudy loved it, he loved all the younger people, as did Victor. They all used the energy of it, they loved the meetings and would have evening parties, inviting all of us. They were us and we were them. But then it became corporate because they weren’t making money I suppose. Suddenly all of us were marginalized for these manager types, so I decided it was time to go. I see a great watershed between the earlier and later parts of your career, when you went from straight, angular, diagonal—linear skewed geometries—to compound asymmetrical curves. That was a huge change. Well, what ushered in that change was more what happened in the design world. People had turned to postmodernism, so all my friends were doing historicist buildings. Venturi, Johnson, Graves, Moore—I always considered them important friends, people I loved very dearly. But I was pissed off that they were going backwards. We’ve just gone through the modern thing, and before that the Beaux Arts, now do we have to go back to the Beaux Arts just because the architecture curator at the Museum of Modern Art decided that it’s time to go back? I kept searching for that motion and one day started looking at fish. They were architectural to me and had movement—that’s when I did the big wooden GFT Fish in Italy, the “kitsch” fish I call him. Standing beside it you felt the movement of the tail. So I asked how much of this kitsch stuff can you cut off and make abstract, yet still get the sense of movement? 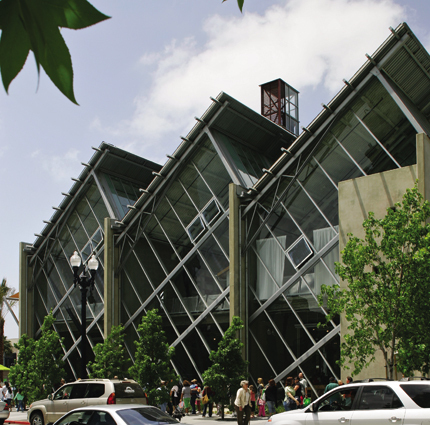 That’s when I did lead-clad fish for the Walker Art Center and for Jay Chiat in Venice, continuing to develop the forms and began to understand how to do it. Finally, I used the computer to help me—that’s when I cut loose. Clearly, doing these curvilinear forms by hand limited how far you could go. Yeah, I just couldn’t do it. If you were to think of Erich Mendelssohn with his beautiful drawings, he couldn’t do it. If he had the computer these things would have been easy. When you look at the Einstein Tower, you realize how incredible that is. Exactly how did you come onto the computer? The turning point was the spiral staircase at the Vitra Furniture Museum. I drew it using descriptive geometry, but since there was a kink in it, the contractors couldn’t build it from my drawings, so that’s when I asked the people in the office, “Isn’t there a way to describe it digitally?” They took us to IBM, who took us to Dassault [creators of the CATIA], and that’s how it happened. In the end I had to build a company around it so they could serve me and now the company is doing other people’s work, and so it spun off into something totally independent. Your two greatest monuments have arguably been Bilbao and Disney Hall. Obviously you’ve done a lot of other work. One favorite of mine was the New York Guggenheim on the East River in the Financial District. Yeah, but that was never real. I knew you couldn’t build out over the water there. The Corps of Engineers would never allow it. What impressed me about that project was its immense scale. More recently it’s struck me that Disney Hall and Bilbao are not just radically different form departures, but also represent a major jump in scale for you—not physical scale so much as aesthetic scale. They’re very monumental but still very accessible. They’re not off-putting. The first time I visited Disney, I rounded a corner and saw it all at once. I thought, “My God, how did he do that?” It was immense and looming like a mountain range, yet was also something very intimate, very human-scaled, even friendly. How do you do that? You’ve got to want to do it, consciously. What gave you the idea that it was even possible? Well, if you look at antiquity it’s possible. Great buildings of the past had it. Borromini did it, Bernini did it. But those buildings were full of fine-scale detail. I know, but that’s the point. By using the sense of movement you replace the details. That’s why I did the whole thing with the fish and then moved into this, because once I understood how to characterize movement at a big scale then I knew I had something. I could play with it, and I let it evolve, that’s all. It was a real breakthrough for me. 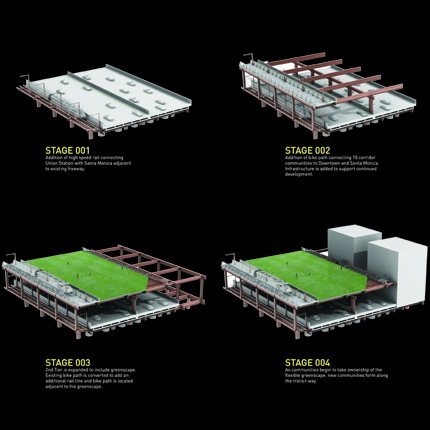 But during the design process, even working with really big models, how do you make that jump? How do you know what it’s really going to be like at full scale? Is it a leap of faith or can you actually visualize it that precisely? No, I visualize it because we make models at several scales, which forces me to shift scale. It makes me think, “Real.” So I don’t let the model become the object of desire. I continually challenge myself about that, to keep myself in “real scale.” It’s worked for me a lot. And then we also build full-scale mockups of parts of the building before I “print it,” so to speak. I’ve spent a lot of time with that idea because during that same period, Michael Graves had the great trouble with it, and we’d talk about it. The drawings were beautiful and a lot of my colleagues’ drawings were beautiful, the models were beautiful, but then the building didn’t deliver. I do lots of drawings, too. They are exciting to people because they’re so scribbly and free, but the important thing is to deliver that feeling to the final building. You have to focus on it and want to do it, you can’t just let it happen. You have to really control it from beginning to end. Looking back on your work, which projects do you like the best and which have been especially significant to your development? Let’s consider residences. They allow freedom because they were easier to play with—the scale is easier. The Smith House, a little addition to the first house I did [in 1959], that let me do my first “still life” village. Then the house for the filmmaker where I separated the pieces and you had to go outside to go to the bathroom—that kind of thing. But I was thinking of production houses then—tract houses—and got the idea of separate pieces so you could put the shapes in the computer, and somebody could pick four shapes and then, on the computer, place them on their lot. They could be mass-produced and delivered to your site. I still think it’s a good idea, but nobody did it. That all came out of houses, and it led to the still-life strategy that I’ve used in many buildings. It’s present in a lot of things, not so much in Bilbao and Disney but many other projects use that idea. But I don’t like doing houses because I don’t feel like I’m doing anything for society. Although it’s nice doing it for a friend. I even have trouble doing it for myself because it gets into closets and things like that. I played with it over and over—after 60 versions I gave up. Which other unrealized commissions do you most wish had been built? The Corcoran Gallery in DC, the Atlantic Yards project in Brooklyn—I don’t think it’s going to happen. There are projects underway that are being threatened, and may not be completed. That would be devastating to me. Grand Avenue in downtown Los Angeles is also on hold. But now we’re working on the Louis Vuitton Foundation Museum in Paris, and that’s exciting. It’s a pretty big building, bigger than Disney Hall. Do you feel some need to adjust to age now that you’re hitting 80? Will you give up playing hockey? Well, I gave that up a couple of years ago. I had a back operation and I was having trouble. Will you cut back on working and heavy travel? I talk about that, but in fact I don’t, and now I’m more excited. I guess you might say I’m Obama-ized—watching him before Congress last night was amazing. It’s not about black or white anymore, it’s about how he’s a real president. He’s the real thing and what he’s talking about is a new revolution in technology—I’m really excited about that. The world’s energy concerns can lead to new architectural models, and not just by that part of the profession that’s using it to get business, putting on their Boy Scout uniforms and doing terrible buildings in the name of “greening.” Now there’s finally traction on this issue, and it’s become something that clients are asking for. We’ve tried it for years and nobody would pay for it—they just wouldn’t do it. So you’re sensing a change in that perception. I really think there is. What Obama is talking about is certainly going in that direction. There’s a lot of technology out there. I was recently called by somebody asking if I could play with new materials that could become photovoltaic. I said yes, and I’ve been very interested in it. I can see you experimenting with that and having a lot of fun, so you’re in no danger of burn out there. No, I’m not going to go there at all, and I’m having fun with the young people in the office. The only problem I’m dealing with is how do I exit. What do I leave here, and should I worry about it? You’ve cut back on staff size—what was the peak? About 250, about a year and a half ago. We were doing Brooklyn and Grand Avenue, they were big staffs, 40 to 50 people each. Now we’re at about 120 to 125. Will you keep shrinking until the economy improves? No, I think we’re pretty steady there unless Abu Dhabi were to stop. You never know about that. I’m doing a Guggenheim museum there with Tom Krens and it’s really exciting to work with him. 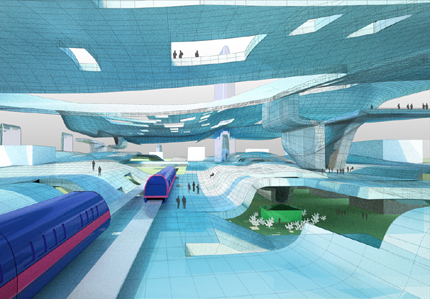 On March 21, SCI-Arc's SCI-FI program and The Architect’s Newspaper announced the winners of their open ideas competition, A New Infrastructure: Innovative Transit Solutions for Los Angeles. The competition, inspired by LA County Measure R—a half-cent sales tax hike that promises up to $40 billion in transit funding for the city— attracted 75 proposals from around the world. 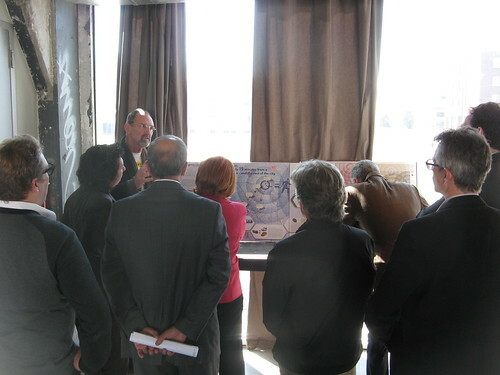 It offered architects, engineers, urban planners, and students a chance to propose new ideas for the city's transit infrastructure. Their entries focused on specific rail extension projects in the city and also take a look at larger-scale, interrelated planning challenges. 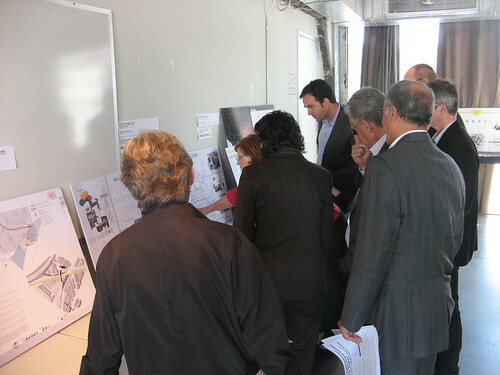 The competition jury included architects Thom Mayne, Eric Owen Moss, and Neil Denari; Aspet Davidian, director, Project Engineering Facilities, LA County Metropolitan Transportation Authority; Cecilia V. Estolano, chief executive officer, CRA/LA; Gail Goldberg, director of planning, City of Los Angeles; Roland Genik, urban planner and transit designer; and Geoff Wardle, director, Advanced Mobility Research at Art Center College of Design. Más is regional high-speed rail for Los Angeles with a landscape to match. Promoting dense, organic development, it diversifies the communities in the built environment, making travel less necessary, easier and more predictable, and bypassing roadway congestion through a new raised infrastructure. Looping around the city, with connections to subways and buses, Más links local and inter-regional commuting; providing frequent service that will also sync up with the California High Speed Rail network. San Diego via más is less than an hour away, including transfer times; San Francisco is less than three hours away. Recognizing the vital role that mobility, water, and sewage will play in Los Angeles' future, the city must begin to invest in a core armature of new bundled infrastructures which will allow the city to survive the impending reality of peak water and peak oil. The city must reorganize along the matrices of transportation, water and sewer networks, and grow infrastructural tentacles out into the world to ship and receive. The scheme proposes eroding a portion of the freeway and supplanting it with a new object, mode, and form for adoration—Mag Luv. 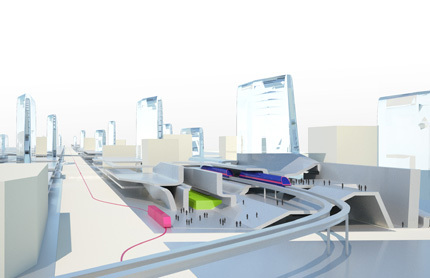 The high speed magnetic levitation peripheral train appropriates freeway, right of way, and “dream space” to become the mega structure of the Los Angeles transit system. The loop circumnavigates the city providing 12 hubs of activity, transportation, and power production. A combination of rail, light-rail, smart cars, bike share, and different bus systems will provide easy connections in and between cities. Multiple vehicle types provide users with choices among combinations of cost, comfort, and functionality. A commuter might choose to ride the train to work, pick up a smart car to attend a meeting, go to the gym, or pick up groceries before going back home. In creating a dense commercial and residential environment to support and foster the inevitable expansion of the transit system, the scheme also investigates alternative development strategies that are adaptable to the ever-changing conditions of our urban culture. 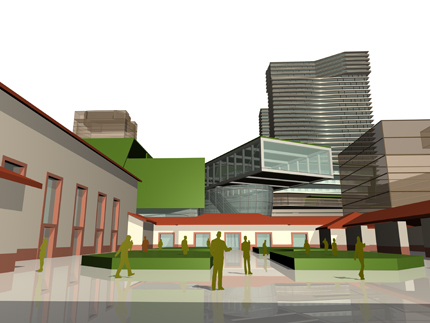 This scheme created green-tech districts along the Westside expansion corridor stretching from downtown to Santa Monica. 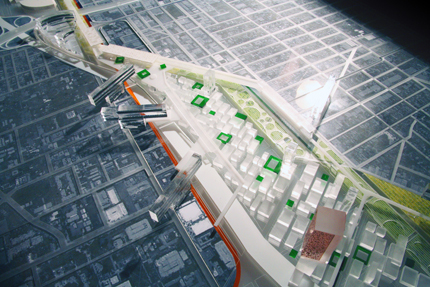 The plan likened itself to a living organism, including a Skeletal System composed of new green districts between stations; a respiratory system that included a 2.5-mile green park along the length of the transit system; and tendons, which were linkages to the community, like freeway bridges, human-scaled densities, walkability plans, urban parks, and agricultural zones. In 2000, LA Metro gambled that it could increase both ridership and transit efficiency by making a bus a little more like a subway: The Metro Rapid. Mixed-modal goes even further to suggest that any bus has the potential to go “local,” “rapid,” or “express” at coordinated points along its route to flexibly serve transit demand. A bus may go “express” by entering grade-separated express lanes shared with planned or existing rail modes, with the help of new frictionless electric power-transfer technologies and hybrid rail/road drive surfaces. 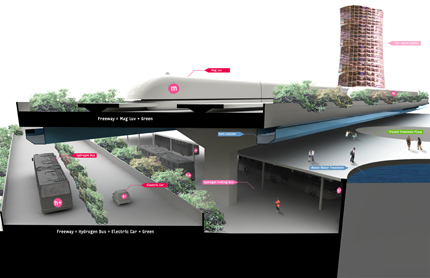 The mixed-modal project offers a vision of what the Expo line might look like if it operated as the “trunk” of a regional transit tree with “branches” extending up and down existing Metro Rapid lines. 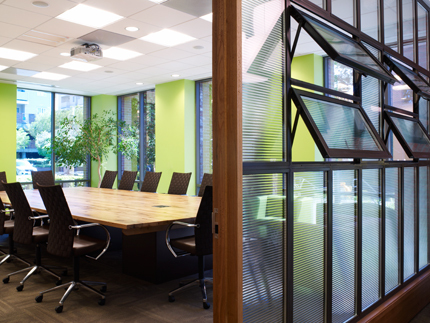 The physical separations between places of work and play have become outdated and burdensome. Meanwhile the divide between commercial, residential, agricultural, and manufacturing zones have become so exaggerated that the infrastructures needed to connect and sustain them crumble in lack of upkeep and congestion. In conjunction with newer, faster transit systems, this plan proposes a simple development strategy that collapses the distances between all the elements needed to support our lifestyles by suggesting that workplaces, as well as production of food and goods, be within walking distance. In a car, the passenger can go from any given point to another in one continuous trip. To achieve this level of mobility in tandem with an increase in roadway capacity, we introduce a mass transit system based upon a Modular Transit Vehicle (MTV for short). This modular system would allow passengers to (1) board from a wide range of street stops, (2) travel along the freeway, and (3) take the freeway exit closest to the destination and drop passengers off there, all in one ride. This team believes that Los Angeles need not invest in a “new” public transportation system but transform its existing transportation system of freeways into “trainways.” By taking over “freeways” with rail tracks, a comprehensive expansion of the LA Metro will respond to the projects that are indicated in Measure R and will commence at a much lower cost due to taking advantage of the rights of ways established by the freeway. If we are to develop along a freeway we need to keep in mind that the surrounding residential neighborhoods need to access the train in a way that encourages a shift away from car dependency. This entry proposes a string of micro-scale infill developments along a bus line that feeds into the Eastside Transit Corridor. 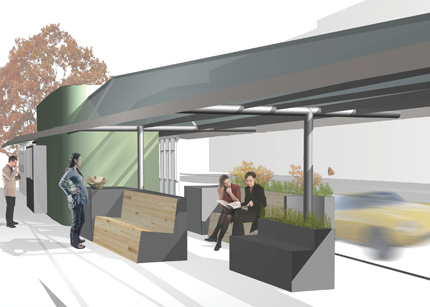 Positioned along newly developed commercial corridors, stops have waiting rooms that store bikes, serve as markets, and create a center of community. 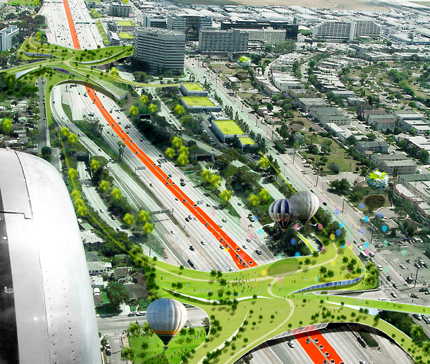 This scheme proposes a reconsideration of the existing freeway corridor as a multi-function transit corridor. 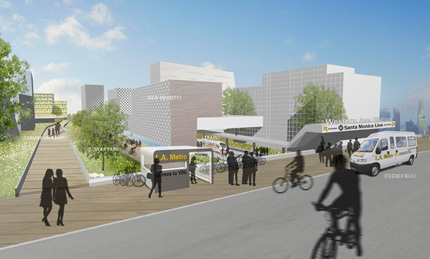 The existing freeway would be retrofitted with a new structure that over a series of stages adds layers of public and environmentally friendly transit options. As this second tier becomes more populated, greenscaping is added, converting the freeway corridor into a vibrant public space. Los Angeles’ current subway network relies too much on a centralized spoke-network approach. A more effective subway system should also include cross-linkages. This subway design project looks to develop a new cross-link between the existing red line (which connects Hollywood and Downtown) and the future purple Westside Extension line. 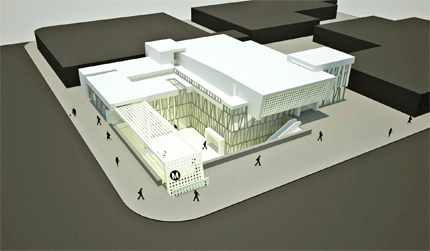 The proposed connecting line would add three new stops: the first at Santa Monica Blvd. and Highland Ave, the second at Santa Monica and Fairfax, and the third at La Cienega. The connecting point to the red line would be at Hollywood and Highland, and the connecting point to the future purple line would be located at the Beverly Center. 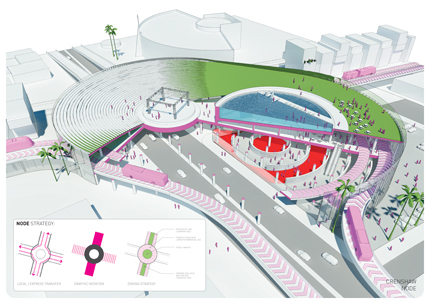 This project takes advantage of LA’s polycentric character, developing a grid of multimodal transit systems, articulated on different levels within the existing city. On the scale of the city, the plan proposes a Free Car Transport System, on the model of free bike systems largely developed in Europe today. Electric cars will be available for hire throughout the city. Other proposals include Smooth Jumps over Motorways: stations that combine the urban proposal of green park links between the two sides of the freeways by building a station over them, and containing contain carparks, commerce, Free Car and Free Bike stations. Instead of the massive, resource-intensive, and inflexible infrastructure that results from top-down approaches to planning, this proposal argues, why not consider a flexible, pragmatic, small-scale, bottom-up approach? 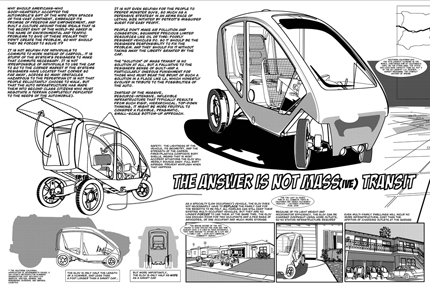 Introducing the Elov, a small, pod-like vehicle that fits into less space than a smart car and reduces the volume of traffic by serving the same number of occupants in only one quarter of the space. Because of its light weight and micromotor efficiency, the Elov can be charged overnight using home outlets, further reducing the required infrastructure. Sponsors for A New Infrastructure include AECOM, Arup, and Sussman/Prezja. 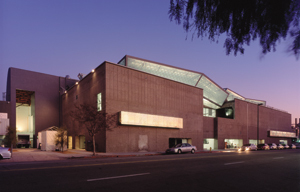 The project is also funded in part by a grant from the City of Los Angeles' Department of Cultural Affairs. Farewell to all that: Photographer Michael Light's Interchange of Highways 60 and 202 Looking West, Mesa, AZ (2007), from the series Salt River/Deadman Wash/Paradise Valley. In December, when President Elect Barack Obama called his economic stimulus plan “the single largest new investment in our national infrastructure since President Eisenhower established the Interstate Highway System in the 1950s,” the media was abuzz with hopes that cities strained by decades of underinvestment would become better places to live. 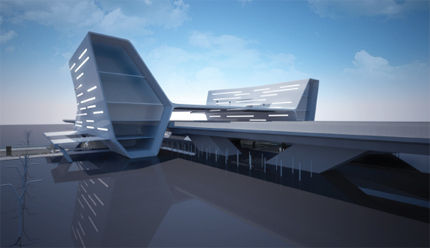 There were even suggestions that building high-design infrastructure would serve as an inspiration to a gloomy nation. Calatrava everywhere! OMA-designed windmills! The possibilities were delirious. So there has been much hand-wringing that as signed into law, the plan allocates only $48 billion to highways, rail, and mass transit. That’s a mere 6 percent of the plan’s budget. 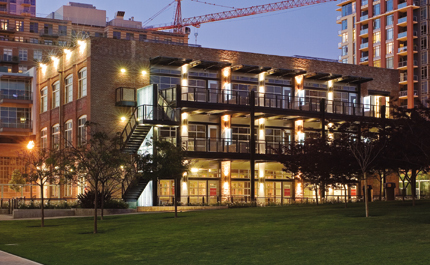 Sure, architects and the building sector will stand to benefit from more money allocated for improving public housing, federal agency buildings, and the like, but the point is clear: Instead of a vigorously rebuilt future, we are treading water at best. We should view this not as another professional snub, but as a major opportunity to get our priorities straight. We all know that infrastructural investment is necessary. But the way architects were talking about their hopes for a bailout made them sound as bad as the banks. So let me make a modest proposal. To paraphrase another president, think not what infrastructure spending can do for you; think what you can do to reinvent infrastructure. Here’s the real problem: Our models for supporting cities have grown as decrepit as the bridges and highways around us. This I learned between 2004 and 2008, when I led a team of researchers investigating the changing conditions of infrastructure in Los Angeles, and producing the book The Infrastructural City: Networked Ecologies in Los Angeles. For us, Los Angeles was a case study: A particularly interesting city, but one that proved the rule regarding infrastructure, rather than the exception. Our conclusions were, first and foremost, that a WPA-style infrastructural push is impossible today. In part, this is because infrastructure tends to conform to an S-curve during its growth. As money is invested in infrastructure, its efficiency leaps ahead, but due to rising complexity, the S-curve eventually flattens and returns-per-dollar invested diminish greatly. Most of our systems are now at this stage: highly complex and very expensive to invest in. 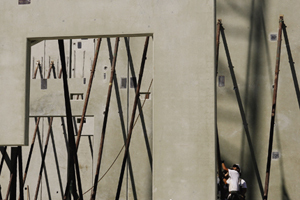 Moreover, costs for infrastructural improvements are vastly greater today than in the past. Thus, even if economist Paul Krugman observes that infrastructure funding generates a greater benefit for the economy than tax cuts, the improvement to urban life we would see from even $200 billion in infrastructure spending would be minor. As the American Society of Civil Engineers has suggested in its appraisal of our failing infrastructure, we don’t need $200 billion—we need $2.2 trillion. And that’s just to shore up the existing hardware. If we’re talking about rolling out new rail lines and green power grids, there are still other problems at hand. The public building boom of the 1960s and ’70s—which was mainly a vast expansion of highways—devastated many communities and drove down their property values. Since then, homeowners have defended their back yards like medieval barons defending their castles, effectively mobilizing to question, forestall, and generally thwart the construction of new infrastructural systems that would theoretically benefit everyone. To think that opposition to vast new projects will evaporate at a time when home values are in free fall is ludicrous. As society has become more complex and interconnected, so should our ideas about how we build and service cities. As a case in point, new “soft” technologies are already transforming hard infrastructure. Commuter train ridership, for instance, is more attractive when you can log onto a laptop and get in two more hours of work while you ride. Similarly, mobile phones have made hours stuck in traffic more palatable (even as they’ve made traffic more dangerous by distracting drivers). We could build on such practices, subsidizing fiber-optic communications lines to Main Street to encourage the growth of offices in downtowns that languish half-empty while peripheral suburbs boom. Or we could add wi-fi to all forms of public transit, encouraging commuters to get out of their cars and into existing buses and trains. But this is only a start, and we need to be daring. We need to reinvent infrastructure with new technologies. I’d like to suggest that we embrace a cultural practice that is about as far from Congress and the White House as can be imagined: hacking. In the post-9/11 culture of government paranoia, hacking is tantamount to terrorism, but in the best sense of the word, hacking sets out not to harm other people but to expand our horizons, using systems in ways they were not intended as a means to free information. This is amply shown by the internet’s rapid growth, which stems from its status as an ideal environment for hackers. Anyone with a small investment in access can build new applications and interfaces. Why not open up infrastructure in a similar way? Legislating open access to data in new and existing infrastructure would allow developers to build applications—many of them as yet unforeseen—that would exploit that data to expand our infrastructural possibilities. Take Google Maps on the iPhone. This service delivers up-to-date information about traffic speeds. Granted, it’s not perfect. Not all routes are covered, the data is too coarse, and sometimes it is unavailable, making real-time routing tricky. Still, I have a good sense of whether I should take the George Washington Bridge or the Holland Tunnel on the odd occasion when I have to drive into the city. With technology like this, there’s no reason why New York’s subway riders can’t be equally enlightened. If the MTA knows where its trains are, we should know too. It’s preposterous to wait forever to get on a local train only to find out—once the doors have closed—that the train is inexplicably going express, right past your stop. Government agencies have such information at their disposal, yet we, the users, don’t. Incredibly, forms of data as basic as subway schedules can still be hard to obtain, often requiring either Google’s muscle or a canny lawyer and a Freedom of Information Act request. As last year’s Design and the Elastic Mind show at MoMA demonstrated, user interface designers and software engineers in urban informatics are already working on these challenges, but should the architectural profession cede the city to them? Leaving such work in the hands of individuals whose primary site of experience is the computer display shortchanges the city. Architects need to find ways to engage with such technology, to make it part of the lived experience of the city, and not just something that happens on a screen. This may not be what architects who long for construction want to hear about, but it’s the sort of thinking that led to the transformations in everyday life that digital technology has enabled over the last generation. The result was a major economic stimulus from the resulting rise in productivity. Architects should not feel left out. Their imaginations are second to none. It’s time to use them again, and to truly rethink what architecture and infrastructure might be. Tone deafness has trickled down to those who create the illusion of taste. Gawker recently let Los Angeles interior designer Michael Smith have it between the armoires for throwing a lavish Fashion Week luncheon at the Four Seasons for magazine editors and Barbara Walters. Isn’t lavishness the soul of Fashion Week? Yes, but by some (anyone breathing) it is also considered bad taste to flaunt wealth during an historic economic meltdown. In politics, as in fashion, perception is reality, and Smith would be wise to manage the public’s view of him. After all, he’s the decorator who realized Merrill Lynch CEO John Thain’s dream of running his company into the ground from a $1.22 million office, while hydrating from a $960 Michael Graves cobalt-blue glass. The media would not have bothered to out Smith as the designer if it weren’t for the fact that he’s been retained by the Obamas to refreshen up the White House living quarters. The irony is that President Obama referred to Thain as a symbol of wretched excess in a speech last month, saying, “Taxpayer money should not go toward renovating offices.” Of course, Smith’s budget for the White House is a measly $100,000 of taxpayer money, which we calculated to be less than the fee he collected for the Thain job. Remember, perception is reality. The lunch, by the way, was given in honor of Desiree Rogers, the new White House social secretary. Awkward. ...Speaking of magazine editors, we doubt that Paige Rense was among the guests at Smith’s get-together. Architectural Digest’s octogenarian editor was overheard at a Los Angeles party last month enthusiastically dissing Smith’s decorating skills. Of course, the disrespect got back to him before you could say commode-on-legs. If a tree falls in the woods, and nobody’s there to hear it, does it make a noise? If a cable show has no viewers, does it exist? No and no. Muse, the virtually unknown show on the hardly watched Bloomberg Network is about to go from unknown to nonexistent, which we acknowledge is just a technicality. Muse was the network’s gratuitous nod to arts and culture and aired at dawn on the weekends. 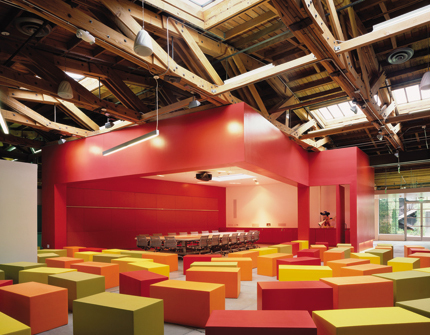 Architectural luminaries such as Thom Mayne, Frank Gehry, Steven Holl, Ben van Berkel, Zaha Hadid, and Richard Meier were among those given air time. Now Bloomberg has decided that business news is more better. We say more is less. It finally happened! 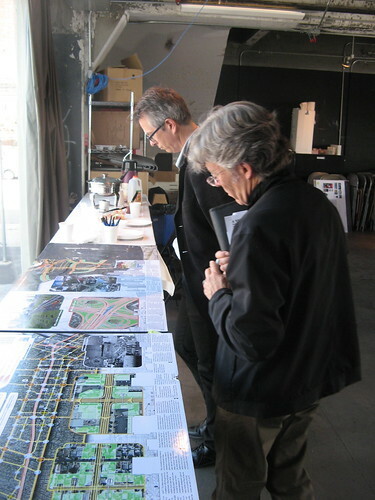 The jury for the AN/ SCI-Arc design competition A New Infrastructure: Innovative Transit Solutions For Los Angeles met at SCI-Arc on Monday to pick the winners. They selected from 75 professional and student proposals from the U.S., U.K., Estonia, Italy, and France. The winners will be announced this Saturday at 2pm at SCI-Arc (960 E. 3rd Street, Los Angeles), followed by a panel with the jurors and an exhibition of the top proposals. The event is open to the public. 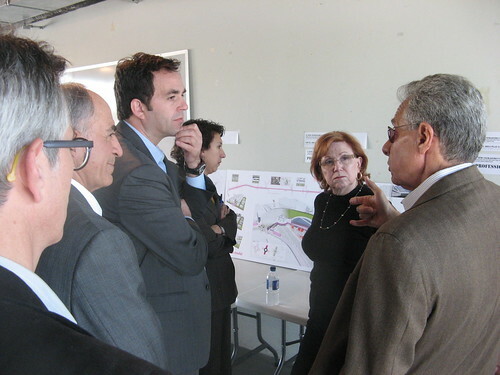 Jury members included Thom Mayne, Eric Owen Moss, and Neil Denari, along with Aspet Davidian, the Director of Project Engineering Facilities at LA METRO; Cecilia Estolano, Chief Executive Officer of CRA/LA; Gail Goldberg, Los Angeles Director of Planning; Roland Genik, Urban Planner and Transit Designer; and Geoff Wardle, Director of Advanced Mobility Research at Art Center College of Design. And after seven hours, two meals, hundreds of discussions, and over 150 boards (ranging from highly practical to intensely surreal), the group picked its top choices. Hats off to them for their herculean effort! Come downtown on Saturday to see the winners and to enjoy the festivities! new children's museum (detail) by rob wellington quigley with erickson-hall.